As herbs go, you could do worse than decide to keep an aloe vera plant or two around. What this succulent lacks in beauty, it makes up for in usefulness. Among other things, the juice from its leaves is an effective DIY pain remedy, often providing almost instant relief -- which you probably already know. It can help blunt the discomfort from some insect stings, too, a fact which may be somewhat less well known. I'm a kitchen klutz, especially where a hot oven and minor burns are concerned. I keep a small aloe in the kitchen window to help make food prep more exciting than excruciating. If burns were beauty marks, I'd have cornered the market a long time ago. (Knives can be an issue, too.) 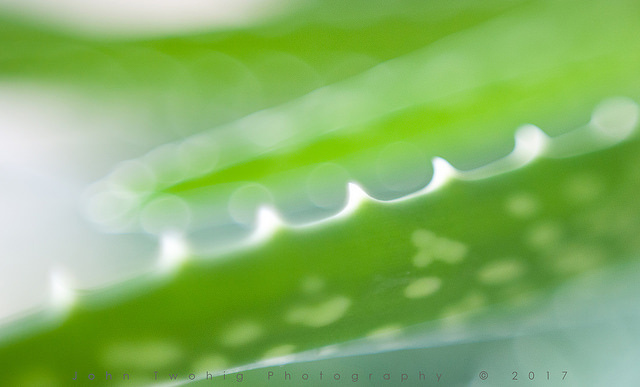 I can't count the times having an aloe leaf around has come in handy, summer and winter. There are some challenges to maintaining this little plant, though. One is that it doesn't stay little. It expands like a kitchen sponge in hot, soapy water, and before long it's bulging out of its pot and producing pups (tiny new plants) with no regard for its now really cramped quarters. Dealing with this kind of success can be confounding. Why doesn't the plant just grow taller? Well, it does that, too -- taller, fatter, leafier, puppier. You get the idea. Another challenge, especially when considering a container upgrade, is that the leaf margins on many aloe vera varieties are designed with protection in mind. All the nice moisture hoarded inside the plant is attractive to wildlife common in areas where dry conditions predominate. Remember, it's a succulent. Nature's solution is to produce a vanguard of prickly spines that look like harmless, decorative leaf frills (how charming) and can dice a gardener's fingers faster than you can say, "Where the heck are my pruning gloves?" When repotting, there's also the problem of where and how to separate each segment or clump for the best results. The mass can look like a Gordian knot of overgrown confusion, and a disaster waiting to happen. For instance, after a little hacking the question will invariably arise: Can a tiny nub of root actually sustain a 6 inch long leaf for the initial adjustment period in a new pot? The short answer to this one is probably yes: Aloe vera roots are mighty. Okay, I'm not going to reinvent the wheel on this. I repot my plants every few years, and made a nice tutorial a while back. 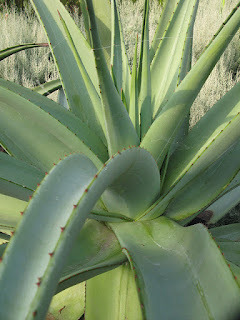 After you check it out, or even before, I've included some other aloe vera related links. They're interesting or fun diversions I found worth a gander. It's the weekend, so why not? *This last is disappointing, but not all that surprising. In fact, herbal supplements and bulk herbs and preparations of all kinds seem to be magnets for fraudulent practices where a less expensive plant is substituted for the real deal, or only a small amount of the desired herb is actually used. Not to put too fine a point on it, but this is a good reason to grow your own herbs whenever possible, and check your sources carefully when relying on others for your supply. If you have herbs in your garden -- or want to -- the idea of keeping them in a tidy bed all to themselves, and close to your kitchen, probably has big appeal. Easy access means you're more likely to remember to snip a few chives the next time you serve baked potatoes. That's not the only draw. Let's face it; some herbs can look shabby when mixed with showstopper bloomers like the ones you probably keep in your landscape beds. What they lack in visual appeal, they make up for in utility, though. One way to make them shine, and keep them together, is to incorporate them into a garden spiral, in this case an herb spiral. An herb spiral is a coiled garden bed that gradually rises in elevation as it curls in on itself. It has a number of advantages. Its construction makes it visually arresting, especially when viewed from above. This somewhat minimizes the reliance on showy plant specimens to make a statement. 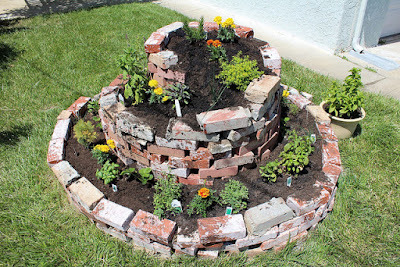 Because it builds upward instead of just outward, an herb spiral can contain many plants in a small space. It also conceals some of the plants behind the curve of the spiral, so a few wispy herbs in the mix are less likely to look "weedy" because they aren't all visible at the same time. One of the biggest advantages of an herb spiral, though, is that the varying elevations in the bed, and its gradual changes in orientation, provide a variety of microclimates that benefit specific herbs. With some planning, this clever construction lets you keep very different herbs together while still offering each the environment it needs (dry, moist, bright, shady, etc. ).